The Quick Lift is designed so that it can be carried on your bike. In the event that you need assistance on the road. Anybody with a receiver hitch can tow you to town, home, or to the repair shop. 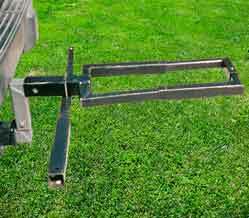 The Quick Lift fits into a 2" receiver hitch and can be used with the Hi-Low adaptor (shown Below) and/or a receiver hitch extension. 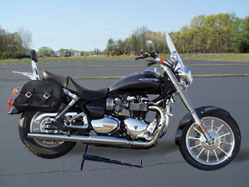 The Quick Lift can be used as a frame stand (on most street bikes) when your bike needs maintenance. The lift arm also acts as a safety stop in the event of the bike moving backward. 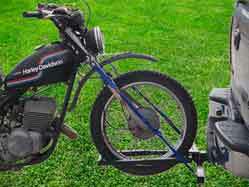 The Quick Lift with a vintage Harley Davidson dual purpose bike properly attached and ready to tow.